New listing! Beautiful home on large corner lot in the heart of Rolesville! The home has three bedrooms on the main level, including the master suite with garden tub, separate shower and a great walk in closet. Large family room with cathedral ceilings, a fireplace and wired for 7.1 surround sound. Great kitchen with tons ofcounters, stainless steel appliances and lots of cabinet space! Huge fourth bedroom/bonus room with its own full bath upstairs! Awesome screened in porch overlooking the fenced yard & huge patio withd the negotiable hot tub! Most of the home just painted too! Roof in 2018. Irrigation system! 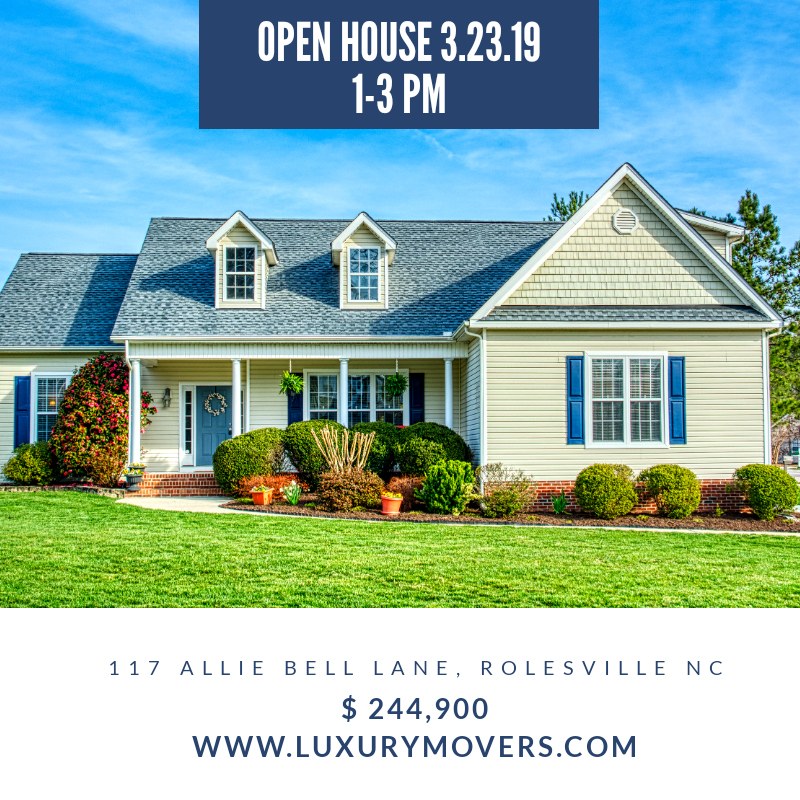 Open house on Saturday, March 23, 2019, from 1-3 p.m.
117 Allie Bell Lane Rolesville, NC 27571 can be found on Google Maps. Visit our agent this Saturday, March 23, 2019, from 1-3 p.m. or contact us at info@luxurymovers.com or 919-424-1867 to see this beautiful home in person!